Muscle definition in the lower abdominals is a sign that someone is truly fit. Many people search for the best lower ab workout because it is a common problem area. Even people that most others consider skinny often have the desire to tone up or reduce the circumference of their lower abs. Achieving this level of definition will of course require some serious dieting, cardiovascular exercise, and at the minimum, the best lower ab workout tips and exercises detailed here. In this article, I am going to show you what you need-to-know to achieve a stronger, tighter abdominal region, however, exercise alone will not give you a super ripped 6pack so make sure you also check out one of our many articles on diet and nutrition. If you’re looking to achieve the results you desire, diet is without a doubt the master key to success. If your diet is in check, the tips and exercises covered here will help you accomplish your goals! Jump to the Lower Abdominal Exercise Videos or continue reading to learn more. Before you tackle the best lower ab workout exercises, I highly recommend you learn some basic abdominal anatomy and why reducing fat in the lower abdominal region is going to be difficult for many of you. The first thing you should know is that your lower abdominals are not an individual muscle. 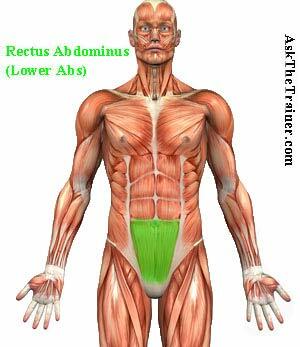 The lower abs are just the lower part of the rectus abdominis or abdominals. If you have not yet visited the best abs exercises page, you should do so. There we cover basic abdominal anatomy in detail and we show you more effective abdominal exercises to help you achieve your goals. You will discover on the road to 6pack success that understanding the basic anatomy of the abdominal muscles will help you to better understand and ultimately maximize your ab workouts. Your body likes to store fat in the lower abdominal region. Due to the extra storage of fat, it will take longer to notice fat loss in this area. This can wreak havoc psychologically as it seems like you are not getting prompt results. Postural alignment can have negative affects on the appearance of the lower abdominal region, making it look as if you have a lower abdominal bulge even though you have low body fat. Therefore, you must make sure you have optimal pelvic posture to avoid this. Due to genetics, some people will have a harder time seeing definition in the lower abdominal area. To get the results you desire, you must have very low body fat. So while genetics may make achieving low body fat more difficult, it is likely you can achieve your goals through proper diet and regular exercise. Another key reason why reducing the bulge in the lower abdominal region is difficult for most, is the undervaluation of diet and nutrition. As I mentioned earlier, proper diet and nutrition is a must if you’re looking to tone the lower stomach. Now that we’ve got all that covered, let’s take a look at the best lower ab workout tips and abs exercise videos. Lower ab workouts use exercises for the abdominals and core. 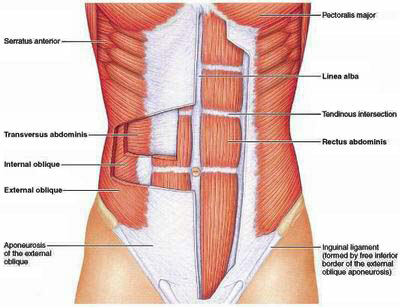 As mentioned before, your lower ab region is the continuation of your upper abs. Solely performing lower ab exercises which attempt to isolate your lower abs could actually be more harmful than good. If you really want to get a complete abdominal workout, you should check out 100 Abdominal Exercises. But before you do, read on to learn all about the importance of proper posture. 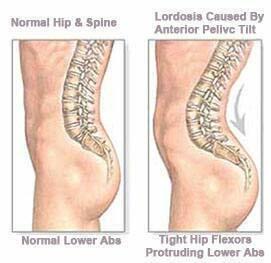 Back problems often arise from tight hip flexor muscles (muscles that lift your knee up). Tight hip flexors are a common problem among the sedentary adult and are the cause of multiple posture problems, often resulting in lower back pain. Tight hip flexors will also cause your lower abdomen to protrude even further, which, will not only cause your abs to look like they have more fat than they actually do, but will also increase your chance of getting an injury. Make sure you check out our article on posture problems to learn everything you need-to-know about muscle imbalances. If you do have postural issues, it is advisable to work on them as your risk of injury is higher, especially if you incorrectly perform core and abdominal exercises. If or when your posture is in order, make sure you keep your core drawn in for optimal results when performing the best lower ab workout, as explained in the best core exercises page. While performing exercises with the goal of targeting your lower abdominals, your body type will determine which exercises to use and how many reps to perform. If you have anterior pelvic tilt and lumbar lordosis (pictured above), you must keep your back from arching during all the lower abdominal exercises. To do this, you have to keep your core drawn in tightly, which means your belly button must be drawn in as far as possible to your spine. You also should keep your glutes contracted the entire time. This will take the hip flexors out and cause you to isolate your lower abdominals. People with longer, larger, or heavier legs will also encounter some issues with lower ab exercises. The bigger and longer your legs are, the more difficult it will be to isolate your lower abs. Never sacrifice form for extra repetitions. If you are not feeling the correct muscles fatiguing or burning, stop and rest. 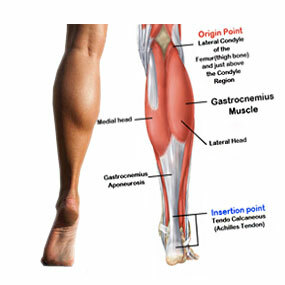 If your legs get tired, you are using your hip flexors too much. If this is the case, stretching them can help. If you just can’t seem to isolate your lower abs, check out the Ab Exercise Videos page for a slew of useful ab exercise instructional videos. In most situations, working out should not be a counting exercise. As mentioned before, quality is far more important than quantity. Abdominal exercise generally get best results when you perform sets in the 20-30+ rep range. Abdominal exercises differ slightly from other exercise in regards to sets and reps. This is because your abdominals are a type I muscle fiber. This means they are highly resistant to fatigue, and because of this, require a higher number of reps compared to most other muscles in your body. The hanging leg raise can be one of the most effective and highest intensity lower abdominals exercises if performed properly. Raising the thighs straight up is improperly performing the exercise. To properly perform a hanging leg raise you must crunch your abs. The motion is the same whether hanging from a bar, on an abs chair. Start: Hang from the abs chair or bar with your legs slightly bent and your hips flexed at around a 20 degree angle. Begin the Motion: From the starting point, bring your knees up as high as you can towards your chest or chin. Lower your legs slowly to the original position with your abs contracted tightly. Modifications: You can perform the motion with your legs straight or slightly bent. If performed properly it will be difficult to do 20 repetitions. You can also twist your legs at the bottom and raise your knees towards your chin. Start: Lie on the floor. Beginners should sit on your hands to assure your back is not arched. Begin the motion: You want to kick both legs together out in a controlled motion until your feet are fully extended, and bring them up and back around. Perform 10 rolls in this direction with proper form and switch to the next direction without resting. The next motion is going the opposite direction. From a bent knee position, push your feet as far away from yourself as you can at around a 45 degree angle lower to the floor without touching then back towards your body. After 10 more keep your feet at the 45 degree angle and begin the next motions. Next hold your legs out at a 45 degree angle and perform 10 circles clockwise and counterclockwise. For this to truly be a lower abs exercise your core must be tight and back not arched for the duration of the exercise. Modifications: If your advanced or have light legs, you can place your hands behind your head. If you are a dynamo, you can put a medicine ball in between your feet or use ankle weights. Start: Lie on the floor with your feet up in the air above your hips. Keep your legs either straight or slightly bent. Make sure to keep your legs as close to hip level as possible. Have your arms out to the side with your palms touching the floor. Keep your lower back flat against the floor for the duration of the movement. Begin the motion: Keep your core drawn in tight. Turn your legs with your feet together sideways towards the floor. Make sure your palms are still touching the floor. When you either reach the floor, or your hands begin to come off the floor, switch directions and turn your legs to the opposite side. Modifications: You can use a form of resistance to increase the difficulty of the best lower ab workout. This can be a accomplished with a medicine ball between your feet, ankle weights, or you can hold a stability ball between your legs. An advanced method is to perform this while on a bench press while holding a barbell. Start: Lie on your back lift both feet a few inches off the ground. You can sit on your hands to assure your lower back remains flat against the floor and is not arched. Begin the motion: Keep your legs fully extended or slightly bent. The first motion to move your legs up and down, alternating in a nice tight motion. There should be no movement at the knees. Remember to always keep your lower back flush against the floor and your core drawn in. The second motion you are going to abduct (away from body) both legs as far as you can. In one continuous motion, bring them all the way back in until one passes over the other and repeat. Alternate which foot passes over the other. Modifications: You can use ankle weights to increase the difficulty. The lower the legs are towards the floor the more difficult this part of the best lower ab workout is. NOTE: You may have found that it is very difficult to do all the above exercises without sacrificing your perfect exercise form. That is why we recommend that you adopt a complete balanced lower abdominal program. You can accomplish this by varying the types of abdominal exercises you do. Learn how to totally isolate your abdominals with the best lower ab exercise videos. Achieve the best results by varying the angles and emphasis of your exercises. Work the entire abdominal muscle group in very little time. Are you looking to totally reduce the body fat around your mid section as well as have washboard abdominals? If you think the best lower ab workout is going to get you your six or four pack abs you’re in for a rude awakening. Learn how to isolate your core. Doing the best core exercises could also possibly translate into the best lower ab workout especially if you have not performed isolated core exercises before. Why Are Abs Machines so Popular? Have you ever seen those commercials on the television for abdominal machines that are supposed to flatten or burn fat from the lower abs? Chances are you have. Are these products worth the price you will pay? Learn why the best lower ab workout on the floor is probably better than 99% of the gimmick fitness products. What! You have never used a BOSU ball before? More and more people are discovering these dome shaped workout wonders. Not as common as stability balls but just as effective for working your lower abdominals and the rest of your body. Click on the body type to find your body fat percentage or enter it if you already know it. Enter in your data and receive a detailed print out of all the information you need to be successful with your exercise program including how many calories to eat and exactly how long it will take if you eat calories. Use one of the most effective training tools ever designed. Its simplicity makes it a tremendous exercise for your lower abdominals as well as the rest of your body.